I’m home in Wisconsin until the 28th. 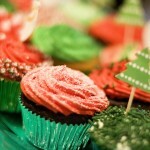 I think I will be doing a lot of baking to pass the time. :) Here is today’s project: Shiny cupcake liners were from Crate and Barrel. 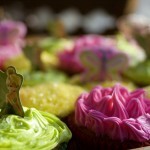 I was asked to make Tinkerbell cupcakes for Malayna’s 2nd birthday party. Finding ANYTHING Tinkerbell-related that could be plopped on the top of a cupcake proved to be quite the task. But I prevailed, thanks to the Giant Party Mart of Chicago. The vivid frosting colors are thanks to AmeriColor Neon Food Coloring.